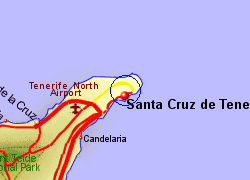 Map of the Santa Cruz de Tenerife Port area. 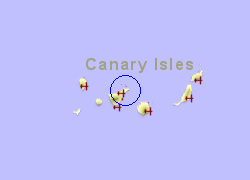 The port at Santa Cruz de Tenerife is located approximately 2 km north east of the capital city. 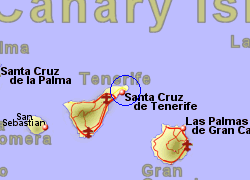 From Santa Cruz there is a good road link south to Los Cristianos via the TF-1, and to Puerto de la Cruz in the west via the TF-5, the former taking an hour by car and the latter 35 minutes. Operated by Acciona with 1 crossing per week, crossing time 8 hrs 30 mins. Operated by Fred.Olsen Express, up to 6 crossings per day, crossing time 1 hr 20 mins. Operated by Acciona with upto 1 crossings per week, crossing time 8 1/2 hrs. Also operated by Armas with 8 crossings per day, crossing time 2hrs 30mins. Operated by Acciona with 1 crossings per week, crossing time 24hrs. Also operated by Armas with 1 crossing per week, ccrossing time 11hrs 30 mins. Operated by Armas with upto 5 crossings per week, crossing time 11 1/2 hrs. Operated by Armas with 1 crossings per week, crossing time 6 1/2 hrs. Operated by Armas with upto 1 crossings per week, crossing time 35 hrs.